Sorry all tickets are sold for this event.Either one of these could fill the room on their own so you know what to expect. Bob is one of the leading singers of the North East and his easy style belies the commitment and passion he brings to the genre while Billy’s pedigree of Lindisfarne and Jack the Lad and his song writing skills have made him a popular performer who is always in demand. 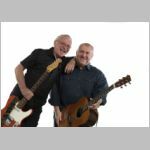 Together they are wowing audiences at much larger venues .